Do you recognize this beautiful property and peaceful setting? 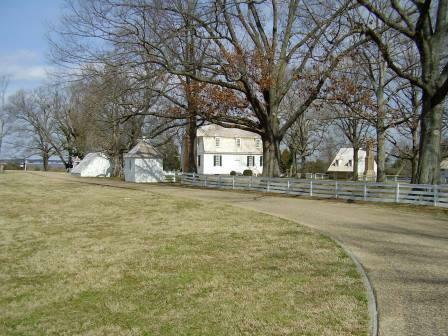 It is The Moore House with out buildings as seen today, very close to the battlefield at Yorktown, Virginia. It is important because it was here in October 1781 that the Articles of Capitulation were negotiated and drafted, finally bringing the British to their knees! Rochambeau was instrumental in planning the winning battle of Yorktown. Plans for the formal negotiations were made at the nearby Moore House overlooking the York River. According to the National Park Service, which now owns the house, the modest frame edifice had once been a part of York Plantation on a site first claimed by Governor John Harvey in the 1630s and later known as the five hundred – acre Temple Farm. Robert Smith was the owner until 1760 when he sold the acreage to his brother-in-law, Augustine Moore. The home is on the edge of the battlefield not far from the center of action. However, in 1781, when General Cornwallis settled into town with his army, many locals moved out of town in anticipation of the battle. It is believed that the Moores moved to Richmond for the time being to escape the coming siege. Unlike that of the Nelson House, which was Cornwallis’s headquarters, the beautiful lines of the well-kept Moore house emerged in perfect condition from the battle at Yorktown, but it was marred during the Civil War. The National Park Service later bought and restored the building. I thought you might like to see what I worked on for 5 1/2 years, and below is a brief summary of the content. I hope that reading this account will whet your appetite to read the entire book. I have attempted to fill in what most history books of the American Revolution omit, the enormous part played by America’s first real friends, the French and the Spanish. My friends tell me that this history book reads more like a novel than a dull, dry account and it’s a page-turner! I love hearing this as we all know the ending of the American Revolution, but the real, true story that led to this conclusion, turns out to be more thrilling! Beginning and ending with Rochambeau, my book traces his early life in the bosom of his military ancestors through his participation in multiple European sieges, recognition by King Louis XVI for valor in battle, and his late night summons from the king to prepare to lead an American expedition, a “special delivery” of French troops and hard currency to aid the revolutionaries. Over a little more than a year’s time Rochambeau and Washington forged a working relationship in spite of their differences in age, background, experience, and preferred military strategy. Eventually they merged their two armies on the Hudson Highlands of New York having determined that without the aid of France’s navy, their mission to oust the British would fail. Patiently waiting for events to fall into place, most importantly for the French navy’s arrival at the Chesapeake, Rochambeau, who spoke little English was thousands of miles from his normal supply lines, displayed patience and sound judgment in convincing Washington to take the final battle of the American Revolution to Virginia. Rochambeau’s 700 mile march to victory in Virginia is laced with personal accounts of American and French officers and soldiers who braved the hazards and deprivations of their nearly three year campaign over what is now named The Washington-Rochambeau Revolutionary Route, aka the W3R. My biography/military history concludes with Rochambeau’s return to France, his involvement in the French Revolution, narrowly missing the guillotine’s blade, followed by the honors bestowed on him by king and emperor and finally his quiet retirement and death in the peace and quiet of his ancestral home, the Chateau de Rochambeau. On this day in history, December 15, 1780, Charles-Louis d’Arsac, Chevalier de Ternay passed away in Newport, Rhode Island. 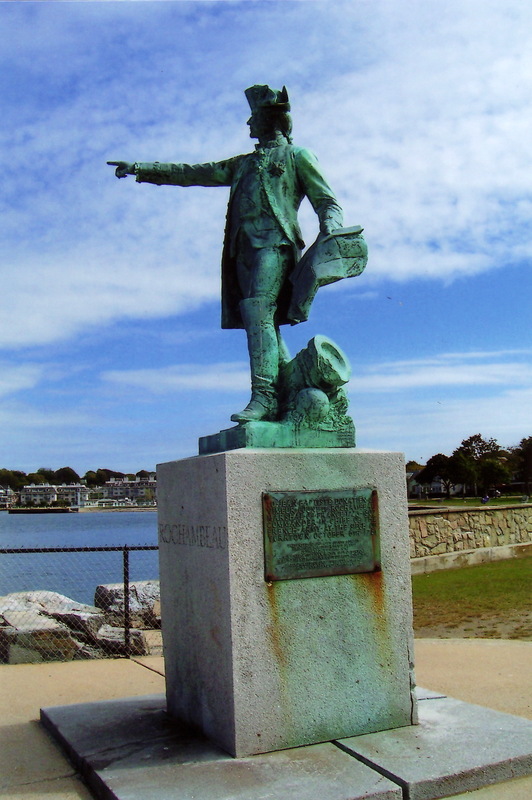 He commanded the fleet of French ships that carried General Rochambeau ;and his army of 5,500 soldiers to America. Admiral de Ternay had been ill on the crossing, but managed to muster to the occasion even so far as to accompany Rochambeau and his aids to the first meeting with George Washington. This meeting was held in Hartford, CT in September, 1780. This is the burial place of Admiral de Ternay at Trinity Church, Newport, R.I.
Below is an excerpt account of Admiral de Ternay death as found in my book: Rochambeau, Washington’s Ideal Lieutenant, A French General’s Role in the American Revolution. 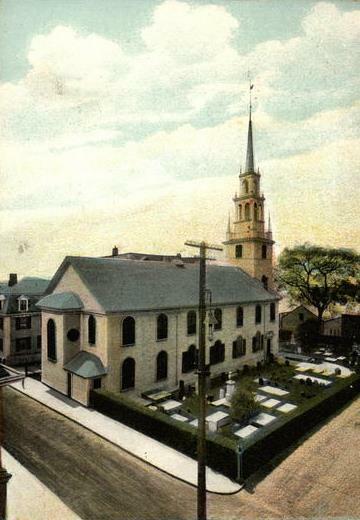 A view of Trinity Church and Trinity Churchyard, where Ternay is buried. To learn more about the bizarre circumstances of the funeral and burial of the French Admiral, read the detailed description of how the Newporters accommodated his religious preferences in my book mentioned above. Yes: The French Are Coming, The French Are Coming! Sung to the tune of the World War I war ditty, only this time they are coming to America, and they are friendly!!! This statue of General Rochambeau stands in 4 places. Do you know where? Who was the sculptor? 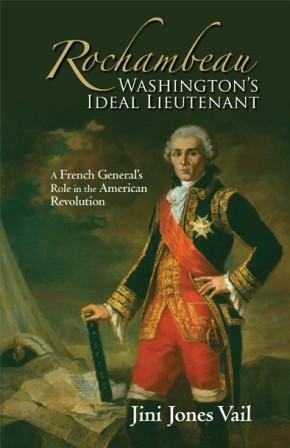 I know where you can find all these answers and more~ Read: Rochambeau, Washington’s Ideal Lieutenant, A French General’s Role in the American Revolution by me, Jini Jones Vail.